Preheat oven to 400°F. Place rack of lamb bone side down. Combine butter and garlic. Coat entire top of lamb with butter and garlic mixture. Sprinkle pepper and salt over lamb. Wrap prepared lamb rack side down with heavy duty aluminum foil. Place lamb in a medium size roasting pan. Bake for 11 minutes for rare or 12 minutes for medium-rare. Open foil carefully and turn rack so meat side is facing down. Secure foil and bake an additional 11-12 minutes. Remove from oven and heat oven to broil. Let broiler heat for 3 minutes. Open top of foil carefully as not to spill any au jus and turn so meat is side up. Cover bones loosely with foil. Broil lamb uncovered approximately 3-4 minutes to brown, watching lamb carefully. Remove lamb from oven and let rest for 5 minutes. 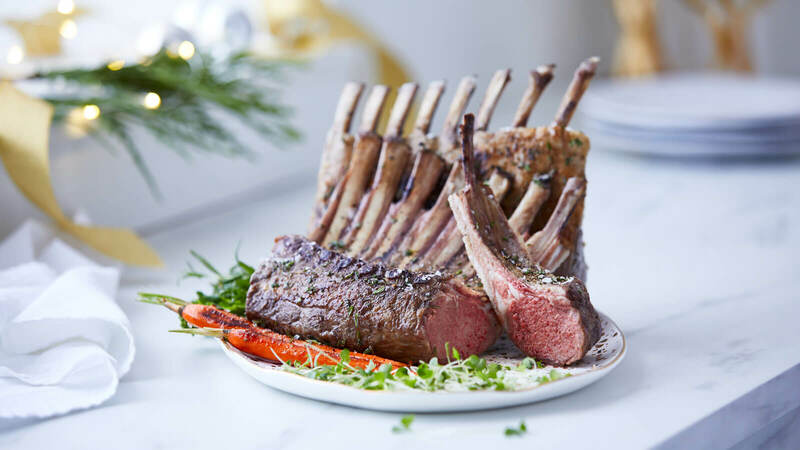 Remove rack of lamb from foil and slice between each rib bone. Arrange rib chops in center plate. Drizzle au jus over chops. Garnish with mint leaves and a dollop of mint jelly.